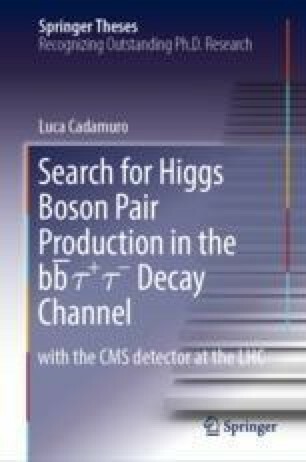 This preamble introduces the reader to the scientific and experimental contexts in which the thesis work has been developed, presenting the motivations for the experimental study of Higgs boson pair production and its role in the exploration of fundamental particle physics at the CERN LHC. The two main topics of this works are the development of an innovative tau algorithm for the CMS experiment trigger upgrade, and the search for Higgs boson pair production in the Open image in new window decay channel with the data collected with the CMS detector. A brief overview of both topics is given in the preamble with a focus on their preparation and evolution, the personal contribution by the author, and the main results achieved.